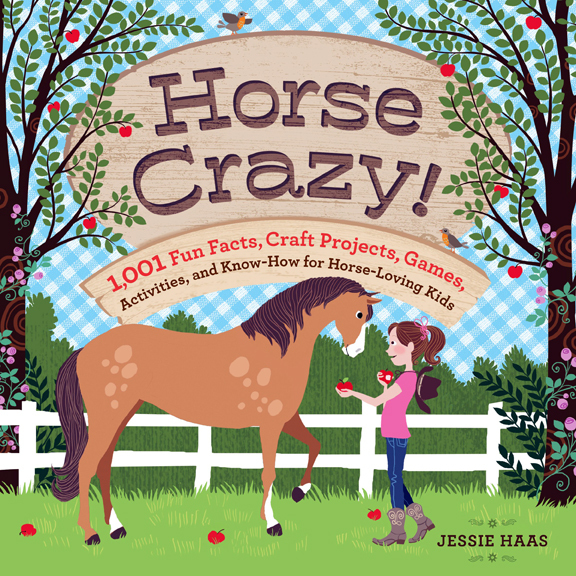 The book begins with “In the Know,” describing the parts of the horse, tracing the history of the evolution of horses, describing the colors of horses, the uses of horses by humans, and more – interspersed with horsey craft ideas, like making a horseshoe picture frame. Part three, “In the Spotlight,” turns attention to model horses, how to write horse stories, books about horses, drawing horses (example Thelwell), and photographing horses. There are even some “good ole horse songs” in this unit. For crafts, there are instructions for making a baling twine scrubbie. Moving to the environment, of course “manure happens!” There’s information on various kinds of stall bedding and dealing with flies. There’s a chart to calculate your carbon hoofprint. This book is a great resource for both horse campers and their camp leaders and trainers.